to wander freely and enjoy this comfy spot. Print it, use it or change it. and whistle those soul-ful blues! And if you're wondering about me and how JeanRepair developed … well this is the tale, and it's one of those ordinary stories in life, with one thing leading to another and then another, without a clue of where I was headed. It all started with having been designated, in my home, as the one that tattered jeans are brought to in need of repairs (... which logically may be connected to my collection of every imaginable sewing apparatus from pins to threads stashed all over the house.) So my devoted flock confidently hand me their jeans and casually ask if I could … "make them cooler" or "fix them for tonight" or "add something" (this is always rather vaguely described leaving much to the imagination) and "fix the holes." They expect miracles and I definitely don't want to disappoint (nor diminish my reputation or pride.) So I eagerly rise to their challenge. These adventures, fortunately, always end with happy smiles. The owner proudly scampers off with their "new" jeans feeling resourcefully eco-clothed. And I relish the sense of satisfaction and pleasure (admittedly also a sense of relief that the owner is delighted) from my handwork. 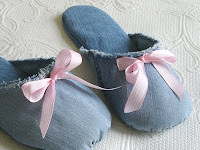 Mending is a soothing craft a lot like knitting, and denim is a soft, interesting and easy cloth to sew. It virtually improves with wear and handwork. But learning how to mend jeans successfully has been sometimes an overwhelming journey. 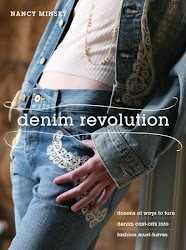 There is no basic mending technique, but rather an endless flow of possibilities, depending on fashion's whims and the way jeans seem to magically adapt to the style of the owner. When you mend, you find yourself looking more closely at the jeans. You realize that no two pairs of jeans are the same and also, depending on your mood (yes it's that nonsensical) you can approach the work at hand differently on a different day of the week. 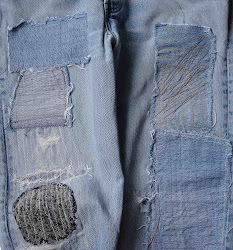 Mending denim is not unlike a blank canvas offering the possibility of individual expression. What worked on one pair does not necessarily work on the next pair. This is the denim charm and cause for its enduring universal appeal. So through trial and error, ripping out and re-stitching, word of mouth, browsing through books, the Internet and my own imagination, I have developed a range of methods that incorporate both fashion as well as practical durability. This bundle of information continued to grow, (along with my expanding pile of discarded denim scraps and waistline…) and finally it all needed desperately to be gathered together into a useful organized fashion. I started to write up the techniques, and post them on my other blog and Scrib. And as I stitched and wrote, I mused about you, and you and you, this wonderful global community of people near and far, who so imaginatively re-fashion and repair their jeans. And I was wondering how to bring us all together to share our enthusiasm, our wishes, interests and experiences. Jeans are after all about people. They weave our lives together through our practical needs, our desire to live a less wasteful lifestyle and our dreamy wishes. and part of this denim journey! This is a great idea. Can't wait to look around and refresh myself with your tips and techniques. So great to see you Nancy! You are a talented girl, you know? Great new blog - looking forward to the posts! 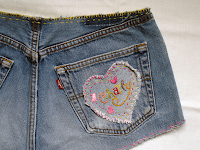 I popped over from a link @ CraftGossip - I have 3 guys in my house that wear jeans for work, so I have a lot of jeans needing repairs ... and the ones that are beyond repairing, get cut down for my scrap box to be repurposed - I'm looking forward to getting some new ideas! Can't wait to get educated! Thanks! Thank you for your comments!!! The fun has started and by the way, a friend, literally, just dropped by my house with a pair of jeans and begged to mend them. Another twist in the denim journey. You never cease to surprise me. All good wishes from a friend who has no blue jeans and makes me wish I had some...shabby jeans have long been discarded to my regret. All good wishes for an inspiring journey which in turn inspires others. thank you for your graceful words, and thereby joining and inspiring this shared journey!